Barometric pressure can be described as the weight of the air at a specific location, measured in inches of Mercury (inHg) or Hectopascals (hPa). 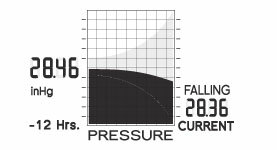 The pressure at sea level is 29.92 inHg. Variations in barometric pressure are associated with changes in weather conditions. Falling pressure typically indicates increasing clouds, possibly bringing precipitation, while rising pressure means clearing skies with improving weather conditions. A Barometric Pressure History Chart is a graph, shown on many AcuRite weather station products, that tracks and displays the historical barometric pressure over the selected time period. The chart curve represents the rate of change over this allotted time period. An example of a 12-hour barometric pressure history chart is pictured above.